Hosting the Olympic and Paralympic Games Tokyo 2020 is an opportunity to foster innovation surrounding sports as well as changes in attitudes. When Tokyo hosted the Olympic Games Tokyo 1964, it marked Japan's postwar return to the world stage, but the event also created a legacy that shaped the capital and the nation. At Panasonic's Cross-Value Innovation Forum 2018 held in Tokyo recently, speakers shared their views on what kinds of legacies the Olympic and Paralympic Games Tokyo 2020 should generate. Tokyo 1964 is often associated with the inauguration of Japan's Shinkansen bullet train, the high-speed rail network that grew into a vital element of the national economy by linking cities, businesses and people. But the event also generated an important intangible heritage. "The Olympic Games Tokyo 1964 created a legacy of sports culture in Japan and it was the first time the word 'Paralympics' was used in Olympic history," Masahiro Ido, an executive in charge of solutions sales at Panasonic, told the forum. "So 1964 was the foundation for Paralympic athletes." While the forum was organized to celebrate 100 years since the founding of Panasonic, Ido was speaking at a session to examine ways in which businesses can make a difference as societies struggle with rapid technological progress and demographic changes. The Tokyo Games are an important lens to examine such changes. Ido noted that 2018 marks 30 years since Panasonic began sponsoring Olympic events with the Olympic Winter Games Calgary 1988. For Tokyo 2020, Panasonic will focus on creating legacies in four areas: airports, urban zones, sports and IT, and security. For example, the company will deploy outdoor air conditioning units with Silky Fine Mist water-micronation technology to combat the danger of heatstroke. Other innovations will include electric bicycle sharing, multi-language translation devices, ticket authentication systems, robotic wheelchairs and software that can analyze athletic performances from video. Panasonic know-how can even provide insights into how Olympians are feeling. "Our cameras can detect athletes' heart rates for display on TV," Ido noted. "We have already demonstrated this with archery and golf, and this technology will be commercialized." Fellow speaker Dai Tamesue, president of sports development business Deportare Partners, is a former track star who represented Japan at Sydney 2000, Athens 2004 and Beijing 2008. In a presentation about the future of sports, Tamesue stressed the importance of changing how we think about limits. 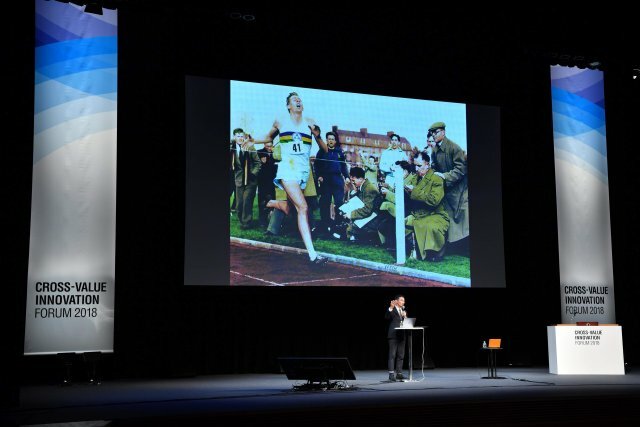 He showed attendees a famous photo from 1954 of British Olympian Roger Bannister crossing the finish line to become the first person to run the mile in under four minutes. Tamesue noted that while the conventional wisdom had held that a sub-four-minute mile was impossible, Bannister's record of 3:59.4 was soon broken; the current record of 3:43.13 is held by Moroccan Olympian Hicham El Guerrouj. The same phenomenon was seen in Japanese baseball, said Tamesue: it was once thought that Japanese players weren't good enough to play in the U.S. Major League, but when pitcher Hideo Nomo joined the Los Angeles Dodgers in 1995, he blazed a trail for others to follow. "I think limits are determined by one's brain, not physical ability," said Tamesue. "We will see great athletic performances in Tokyo in 2020, but I think changing mindsets will be the greatest impact that we can create." Toshiya Kakiuchi, founder and president of universal design consulting company Mirairo and representative director of the Japan Universal Manners Association, addressed the importance of changing mindsets surrounding people with disabilities. A wheelchair user himself, Kakiuchi described what it was like to grow up with a bone disease that left him unable to walk and hospitalized numerous times. It was during one of his hospital stays that Kakiuchi read a book by Panasonic founder Konosuke Matsushita that inspired him to change the way the thought about his condition. "If you just change the way you look at things, impairment or disability can be converted into strength, something positive," Kakiuchi said. "It can change barriers into value." Kakiuchi has traveled in Japan and overseas, including visits to Olympics venues in Brazil and South Korea, to share insights from the perspective of people with disabilities. He cited a concrete example from Mirairo's business of app development: its Bmaps app is a platform for users to share detailed information about accessibility. For instance, just telling wheelchair users that a building has steps isn't too helpful - if there's only one step, a wheelchair user might be able to overcome it, but multiple steps require carrying the chair, Kakiuchi said. That's the kind of mindset that's necessary to make the Tokyo 2020 truly open to all. "Japan is a rapidly aging society, therefore barrier-free universal design must be promoted," Kakiuchi said in his concluding remarks. "By converting barriers into value, let us build a new future and new convictions together." Mr. Toshiya Kakiuchi, President of Mirairo Inc.